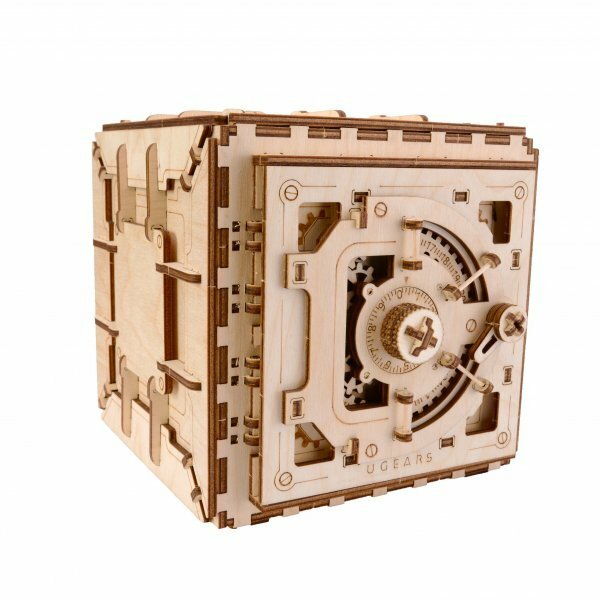 UGears Wooden Safe is your master training tool that will help to break into the security business. 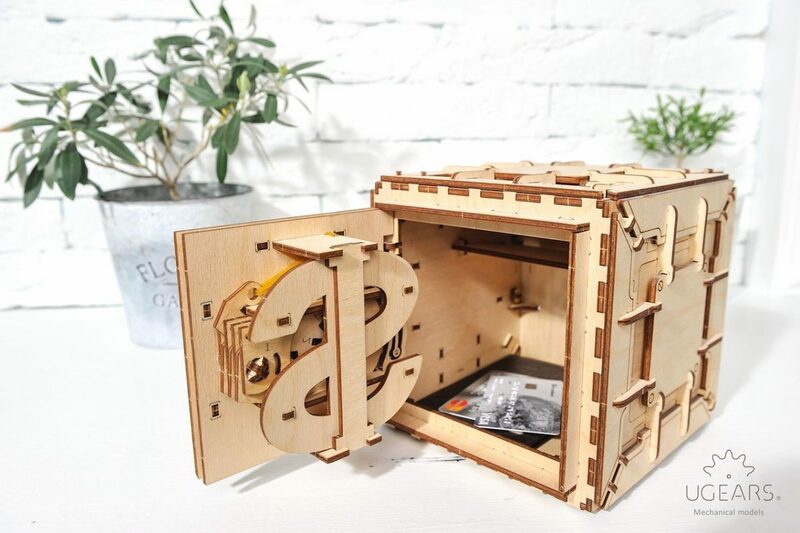 This model construction kit allows you to build your own safe featuring a real working combination lock and a perfect storage for some of your most precious small items. 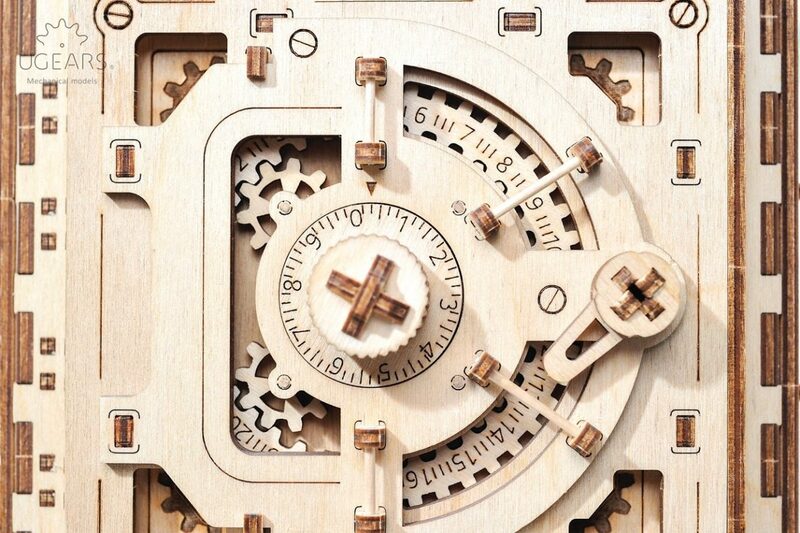 Follow the steps in UGears Safe instructions to master your lock manipulation skills. Learn how the tumbler wheel packs, drive spindles and fences operate and, maybe practice a little safecracking on the side (just for fun, of course). An outstanding gift on its own, once assembled, it can be used over and over again to practice some safecracking skills. It is possible to get the right combination by twisting the knob and listening carefully to the clicking sounds (provided the safecracker knows the basic algorithm for opening the lock described in the instruction manual). 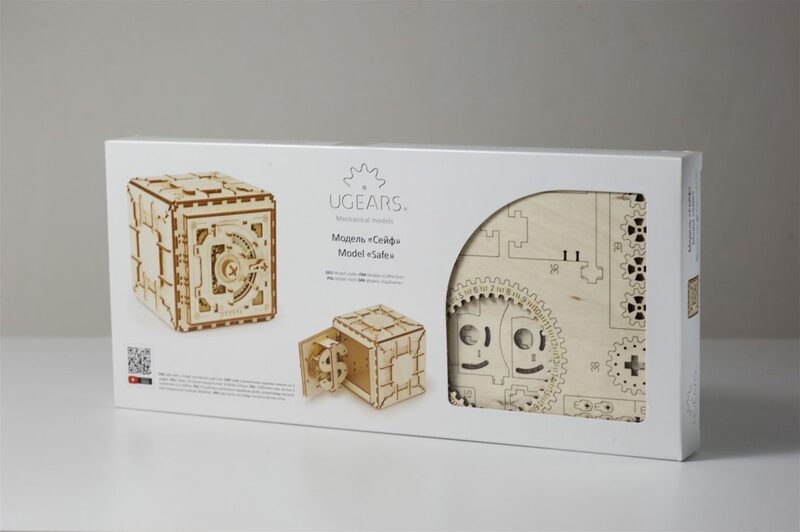 UGears Wooden Safe Box is a great customizable toy, guaranteed to bring fun! Just as a comment, I just finished assembling the safe puzzle. 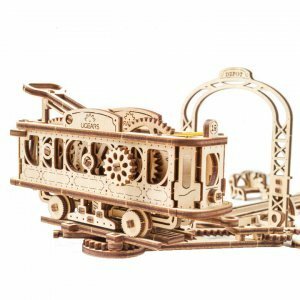 I am amazed at the quality of the puzzles you are selling/making. They are a challenge, fun and actually function in some form or other. I will be back for more. Its a real safe! I mean, what a genius idea, to make a puzzle that later becomes a cool, functional item. These Ugears guys s are brilliant! Definetely, a neat, cool piece! Great for a present. Looks very unique, and is even more sophisticated when put to work. Seems fragile, but not quite. The wood material this safe is made with, seems delicate, however, the whole structure is rather sturdy. The only down side of this piece is its price. 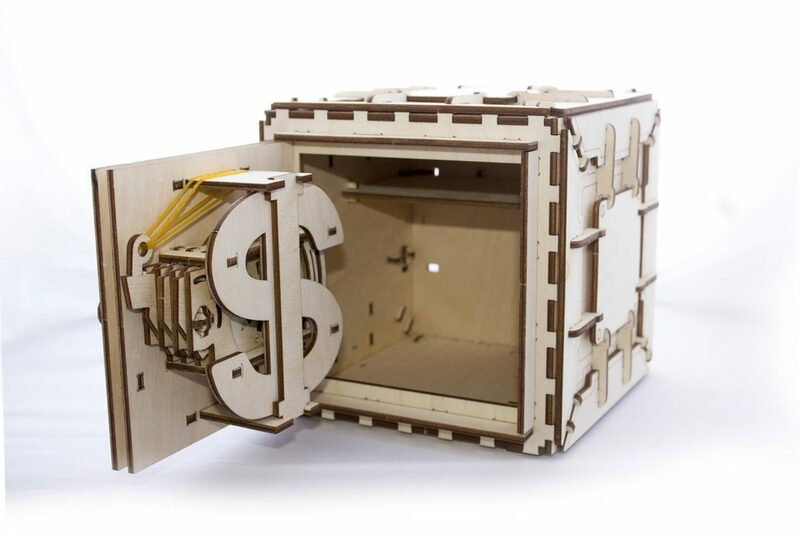 However exciting and original it is, paying over $50 for a wooden box feels a little unfair. this was a gift to me by my coworkers as a farewell gift. I really liked the quality of the wood and the fine details of the parts. However, the assembly was a nightmare. Despite the seemingly easy instructions with pictures, I had hard time figuring how the whole thing comes together, and I was also afraid that I may break the delicate wooden pieces and could not really enjoy the construction process. The end rest, however was much more pleasant. The safe came out looking really nice and neat. I picked this safe as it seems to be the most popular item in this collection of 3-d puzzles. At first I had doubts, because of the price. But when it arrived and I started working on it, I understood why the price is slightly high. This safe offers much more, than just a put-together kit. It also is an extraordinary storage, an entertaining toy, and a really neat knick-knack. Got this item ordered as the most popular in the collection. Its very different, unique and sophisticated. I couldn’t quite place this item, however. Its not really a toy, neither its a functional item. You sure can definetely with the lock combination or keep a wristwatch in it, and it is fancy enouph to take place among the collectibles…but the I still am trying to figure out this items’ main purpose. One thing I must say about the safe – it is definetely, very different from anything I have seen before. The puzzle is expensive but just so… amazing! I had a great time fiddling with this puzzle on my day off. Although, it is MUCH easier when you look at the instructions. My parents and I have been fighting a lot recently and it’s mostly because of stress. I had some gift cards left from Christmas and a few of them were for Amazon.com. While looking on website to buy something all three of us can work on together, I cam across Ugears safe. When I showed it to mom and dad, it stopped the arguments almost instantly and I was wowed at how a simple, not-so-simple building activity managed to bring my parents and I closer. 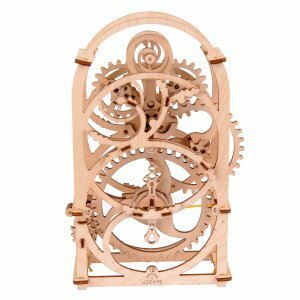 When my boyfriend mentioned to me that he wanted to spend more time with together, I immediately thought of a collection of mechanical models I saw online. Him and I often enjoy doing projects together, mainly occupying garage space for the workshop. 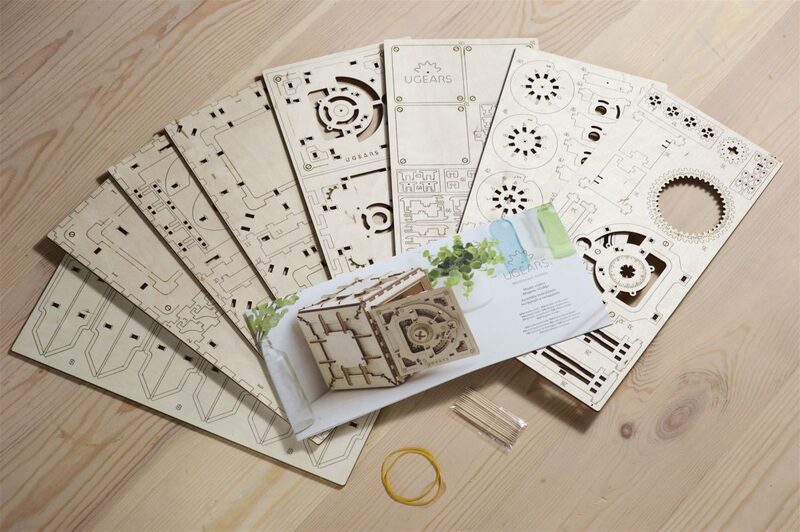 However, on colder days I prefer to stay in a comfort of the inside of our house, and Ugears construction sets are perfect for that! When we received Safe in a mail, we couldn’t wait and started building it right away. It took us some time, but in the end we couldn’t believe the outcome it brought. It was so pretty! I have a lot of anxiety due to the environment I live in. 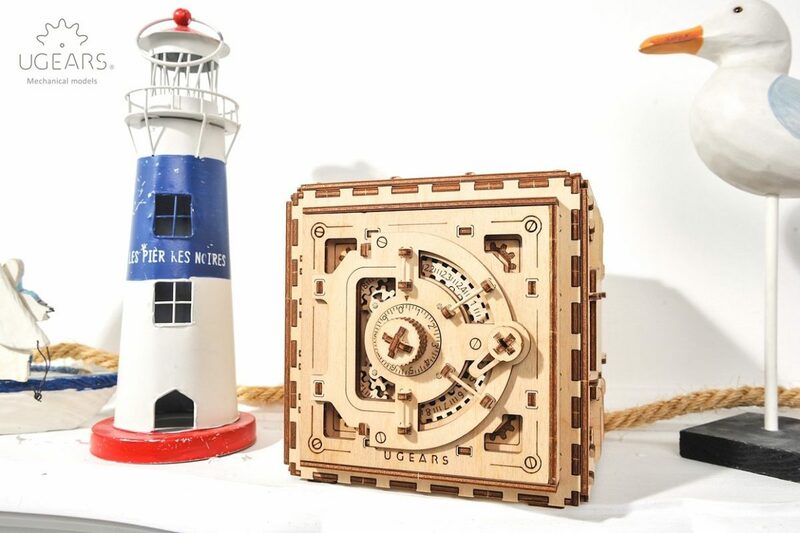 This wooden safe puzzle is a nice way for me to relax after a stressful day at work. I am a mother of three and my oldest son loves to carve wood. I figured what better way to give him some wood-caving designs than to give him this safes a gift. He instantly went to his workshop and began to build it. It now sits in his room along with a few other Ugears creations. He’s so proud of himself when he finishes them. I was searching for my sister’s birthday gift, she told me she didn’t want anything too expensive. I was searching for something online and came across this. I couldn’t not buy it. The only thing that made me hesitate was the high price. But when I bought it and gave it to her, she absolutely loved it. I just hope she isn’t mad at me for the giving her a pricey gift after she specifically told me no gifts at all. I’m amazed at how well this has kept my twelve year old twin boys. It gives me some time to get some work done in peace and not be interrupted. When I first gave them this, I was worried about the unusual silence and decided to take a peek in the living room. I was astonished to see that they were silently trying to figure out the puzzle and I was very happy to see this! My son keeps his favorite miniature car models inside this safe. We had an amazing time putting it together, but I don’t think he understands how to open it just yet. The puzzle, as complicated as it is, keeps my anxiety under control after a tough day at work. I take about 30-40 every night after dinner to try and put it all together and it looks like I am about to be done with it. I have been doing puzzles for decades, it is my way to unwind from a busy day, however this safe model is unlike any puzzle I’ve ever done before: it expanded my world past simple flat jigsaw puzzles. I am super excited to complete the safe and enjoy cracking the lock code ( it states on product description that the safe combination lock works like a real thing). I love how this puzzle takes a long time to finish and not just half an hour. I also love how I can take my time on it whenever I get home from work. My husband seems to love it as well. I was given this Ugears safe as a birthday present and I couldn’t have asked for a better one! It took my anxiety right away and I had a grand old time figuring it out. My teenage daughter created this safe a few weeks ago. She was looking for something with a lock, so her baby brother wouldn’t take and break her jewelry. the safe on a picture looked beautiful and sophisticated, however, once i saw it put together, it blew my mind! I can’t get over its intricate design and brilliant execution. 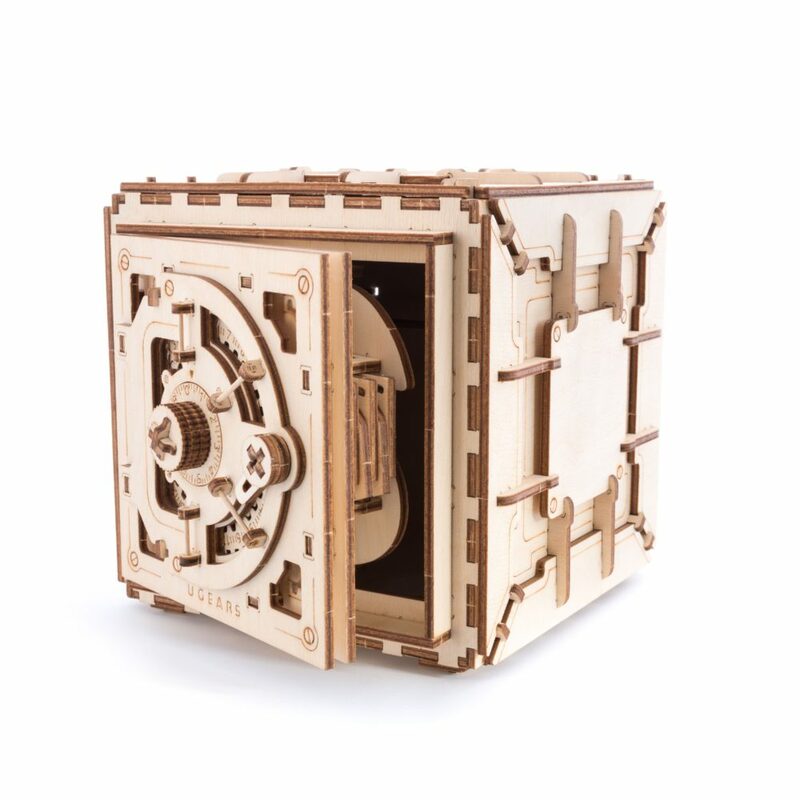 We’ll be looking for more models similar to the safe but less complex, something my teenage daughter and her little brother could enjoy working on together. This puzzle is an amazing way to keep your wild kids busy on a rainy day! Mine had quite a day trying to figure out how put it together. It took them even longer to figure out how it worked. We’d be lost, but thanks for instruction manual we solved this cool puzzle! Incredibly Safe Safe.It’s quite pricey, but for good reasons! My son and I had a grand time figuring it out. My wife even likes how it kept us quiet for so long. 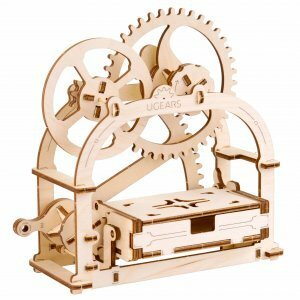 I got ugears mechanical 3d safe as a gift for my son’s middle school graduation gift. I was surprised as this model doesn’t look like most of puzzle we’ve seen. Its wooden and made and feels like a real thing, My son loves it and I was impressed. Lots of small parts and at the start ugears safe instructions were confusing, however it all came along in the end and worth the time and frustration. My sons loved the fact it is like a real thing, and the combination lock works exactly like in real safes. Watching boys working together wants me to give another model a try. This was a gift for me from me. I needed something more than just a puzzle ( those I mastered) as i am homebound and spend a lot of time inside my house.. this safe model kept me busy for hours, and it was a different kind of fun. after i was done putting it together i liked it even better!!! it has one of these safe lock combinations when you turn a knob to get the right set of numbers to open it.. I keep playing with it. I recommend it for people like me, who can’t get out of house often. Just have a look at ugears safe video on youtube and u will love it! A Safe wooden puzzle was given to us as a gift. We let it sit on a counter for a while as we were not familiar with 3-d wooden puzzles and thought it was something complicated and not much fun. But the fun was all ours and right in this model! It took a couple of hours to toggle back and forth with instructions, but finally the safe was all done. Amazingly, assembling it was interesting; every part of this ugear safe is a piece of art that came together into a true masterpiece of puzzles. The best part – we didn’t have to break it up and store it in a box! it claimed its permanent place on a bookshelf; somewhere between a vintage photo camera and a porcelain figurines. 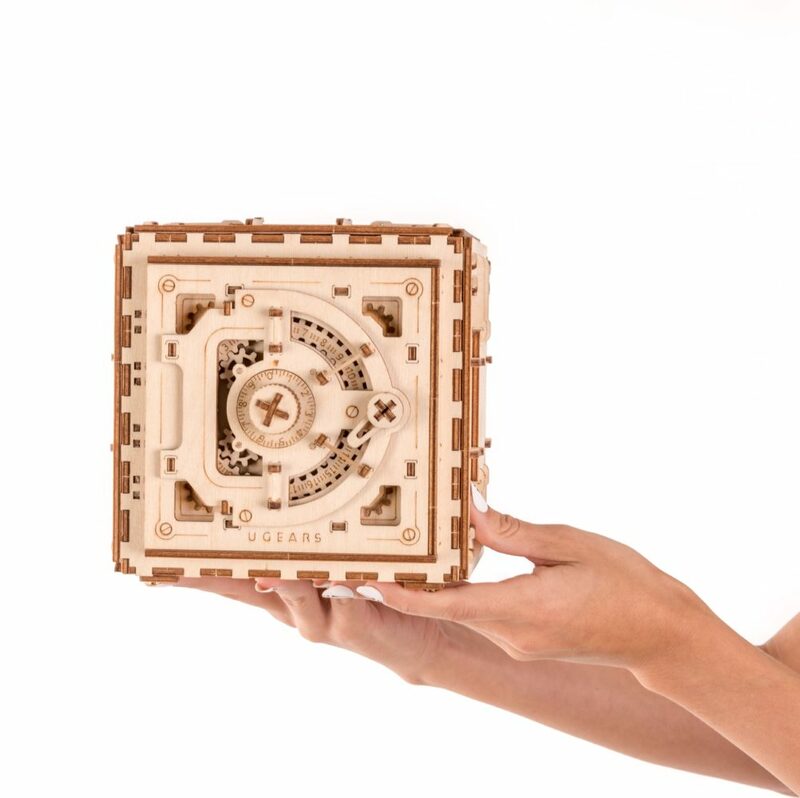 We’ve got a Safe puzzle, and though it was interesting to built, the toy turned out to be very small and impractical. The instructions to this ugears safe combination are also somewhat confusing. However the assembled piece is quite fun and attractive for the eye. Next time, perhaps we’ll choose an easier model.